Kevin Kubota and Kubota Image Tools blog covering photography tips, photo workshops, photography gear reviews, image enhancing software for Photoshop and Lightroom, software and workflow tutorials. Welcome! This is the blog from Kevin Kubota (me) and Kubota Image Tools (our company). Our mission is to empower photographers, share knowledge, and find ways to make the world a better place. Thanks for joining in! Scrims are some of the most versatile light modifiers you can own. They diffuse the sun, or a flash. I put my speedlight (or studio light) behind a large, 4’x6’ scrim and can create gorgeous window-like light just about anywhere. You can buy scrims like this from various sources, or build one of your own if you’re on a tight budget. With a LunaGrip light modifier and one of these large scrims, you have a knockout combo of tools to create almost any kind of portrait or product lighting, anywhere – and it all folds down nicely and is easy to carry. I’ve created a video showing you what to buy and how to build your own scrim for about $20. Have fun and share some of the images you create with it! This was a frame grab pulled from the 4K RAW video on the Sony FS5. The original is of sufficient resolution to make a nice 11x14" print. More and more, still photographers are finding their way to commercial video/filmmaking. For years, still photographers have seen the value of utilizing slideshows and now we see the heightened value of using moving imagery to tell a story. Visual storytelling using film/video is a natural progression for the still photographer, however, that progression has a steep learning curve – and expense. In the beginning we experimented with different cameras, ways to move those cameras, attached the cameras in unique places, fly the cameras – all while trying to attain the best image quality and audio possible. Things broke. It was exhausting, frustrating, and absolutely exciting. It still is. While DSLR’s are quite capable when it comes to filmmaking, they definitely have their drawbacks. It wasn’t long before we realized that although we had purchased gear that enabled us to move the cameras cinematically (sliders, DJI Ronin, Aviator Camera Jib) the camera itself needed an upgrade. Enter the Sony Fs5 Super 35 camera system. The FS5 gave us more than a few things that a DSLR couldn’t: The possibility of full 4096x2160 RAW 4k (with optional $499 upgrade), (2) XLR audio inputs (this is huge), built in electronic variable ND filter (even huger – is that a word? ), 240fps (super slooow-moooooo) SDI in (not as finicky as HDMI) and roughly 14 stops of exposure latitude, to name a few. This camera was just what we needed to show every detail of our favorite bikes. Could we also shoot other commercial projects with it? I’m glad you asked. Recently, we were asked to film a piece for our friends at Zamp Solar in Bend, Oregon. Zamp makes ridiculously cool gear for those on the go and who want to rely on the sun to keep them charged. The catch here was that Zamp requested a FULL 4k final output of 4096x2160. The Sony Fs5 isn’t able to output that resolution to the internal SD slots, even with the optional RAW upgrade license. Strange, but that IS a lot of data. We needed an external monitor/recorder that could capture 4k RAW at 60/120 framerates – and do it well. After much research, we landed on the Odyssey 7Q+ from Convergent Design. The above footage is direct from camera with no color grading, so you can see the original quality. On and off paper, the 7Q+ is a technological data recording beast. The recorder has (4!) SDI inputs and (4) outputs that can allow for multi-camera monitoring, zebras, histogram and false color for ensuring proper exposure, focus assist, spot metering, image guides for different crop modes, and the ability to preview images with LUTs. (Just took a breath). The best way to describe a LUT (Look Up Table) for someone coming from still photography to video is that it works somewhat like a Lightroom preset. Just like with still photography, most people now are shooting RAW (not IN the raw – that can cause trouble) to get the most information off the camera’s sensor. Same with video, RAW is, well, the RAW image. Imagine a client looking over your shoulder and thinking,” This looks horrible, why did we hire this guy? My sweet orange bikini line looks like something from a Hitchcock movie.” The Odyssey allows you to preview the image with several different LUTs to ensure the image the client sees is one that keeps you on the set. LUTs can also give you an idea what the (color) graded image may look like in post – without the post. This feature alone is huge. The Odyssey records the massive amount of data it collects to two SSD drives, sold separately. While you need to purchase the drives additionally, the Odyssey comes nicely equipped with cables and SSD handles in the box. Kudos Convergent! Upon receiving the Odyssey and getting more information on the job – it was apparent that we were going to need to operate this device where even the longest extension cord wouldn't reach. I was a bit concerned. After some research, I found that Convergent had thought about this long before I did and manufactured a plate that easily mounts to the back of the Odyssey that enables you to power the unit with the widely available Sony L batteries or Watson equivalent. Those new batteries needed charging, so I purchased the Watson Duo charger and it works flawlessly. The Odyssey 7Q+ records a number of file formats: Apple ProRes422 (your computer likes these files), uncompressed DPX (your computer may not like you) and RAW (Note to self, learn about Proxy file). Unfortunately, on top of the $1795 price tag of the unit, RAW recording isn’t included. Users have two options at present to unlock RAW capability on the 7Q+: A one time $695 fee, or a daily license rate of $99. We opted for the daily license. To purchase a daily licence for your Odyssey you’ll need to set up an account at the Convergent website http://convergent-design.com . From there, you can register your particular unit/serial number. Once you purchase a license, the license key is emailed to you along with a receipt. My first order attempt failed as Convergent were having some technical issues with their website. I contacted them to let them know I was having difficulty and received a very quick response and fix. In fact, for my trouble they gave me an additional day license. Once I had the license key, I struggled to get the key to install using a alpha numeric code within the menu system. This may or not have been user error. Okay, it was user error. I’m just going to throw out that there is, in fact, directions that IF you read – will guide you through the process quickly. I, however, skimmed. Apparently, there are two ways to access the license key install in the menu, and I was in the wrong joint. The point of this is that you should always read the directions but more so, the customer service of Convergent is unparalleled. Quick response after quick response, and all the while they were genuinely interested in helping get things rolling. Mounting the Odyssey to the camera cage didn’t seem like it was going to be an issue, just use an articulating arm, right? Please, please hear this: Do not buy a cheap articulating arm. Saving money here gives you the ability to file an insurance claim on your brand new Odyssey 7Q+, or leave town quickly whilst your friend wonders what became of you – and his beloved device. We had several close calls by using what we thought was a good articulating arm. Better yet, use a monitor extension arm or put the Odyssey in an enclosure and mount to a tripod or c-stand if possible. Playback on the Odyssey is as simple as toggling the record/playback button, from there you can watch the previous clip, or scroll through a thumbnail list of the day's action. The 7Q+ allows you to easily scrub through clips, give text notations to clips, and flag in and outs – that’s huge! Imagine an editor who wasn’t on set having to scrub through every clip to find selects. Those selects can now be set by the 7Q+ operator. Even if you’re acting as DP on set as well as editor for the piece, this function can save you time. Offloading the files from the 7Q+ is a breeze. One needs to simply shut down the device (you must power down before ejecting your SSD’s or your clips won’t be visible – I learned this by reading the directions) pull out the SSD’s, and connect them to your computer via the included cable, or by using a USB or Thunderbolt SSD dock. This is a good time to remind you to check the Convergent website for a list of approved SSD’s. Yes, it’s pretty. It has a ton of options. It’s upgradable and the customer service is amazing. So, what’s not to like? It’s easy not to enjoy the cost of such a device, especially when you need to pay additionally to unlock special features – an “in app” purchase if you will. That coupled with additional items like SSD’s, battery plates, field batteries and an extra charger can be a bit overwhelming. When you realize the quality the 7Q+ gives you and the potential time savers like notation and marking in and outs, it helps to ease the financial pain. I know I’ve mentioned customer service and support, but it’s nice to know that you’re not buying an expensive piece of gear to be left out in a field, alone, if something isn’t working right. I wasn’t a big fan of the on-line website/license key process, but a one-time RAW upgrade payment would take care of that. My only other beef with the unit is the way the files are sometimes split. What? When going through my files in Premiere Pro, I noticed that many of them were split, cut in half, separate, divorced. I manually reunited them. Not terrible on a small job, but horrible for a larger production. After a quick reply from Convergent support, this is common given the way the 7Q+ has structured the file system (4GB max, Fat32.) An easy fix, but an additional step, is to use the free software from Convergent that turns all the clips into a single .mov per track and also optimizes the files for playback on your computer. That’s like having to drive 5 extra miles for some really good Thai food. The pros far outweigh any cons with this device, and any storyteller looking for the highest quality recording with their FS5 would find it a welcome addition to their gear bag. I’ve included a few files for you to check out. First, a still image straight from the Fs5. By enabling RAW recording in the device, every frame we shot (60 per second) were each a 4096x2160 file. Nearly a 7x14 inch image! That is an insane amount of data – of which you can pull very nice still frames from. Talk about making your client happy. Coupled to the FS5 for these shots was the Nikon 70-200 2.8G ED VRII lens, one of my favorites on the Super 35 format for a film like look. Also included, a couple of video files straight out of the FS5 and onto the Odyssey7Q+. No color correction, no stabilization, 60 fps, shot in sLog2 (a very flat picture profile used when a lot of post production and color grading is planned for the footage.) These files have been downsized from the original 4k resolution to 1080p. We’re still a few weeks out from a final export, but I have no doubt the graded footage is going to be spectacular, especially on the client's full 4k TV. The Convergent Design Odyssey 7Q+ is an amazing production tool and we highly recommended it. Granted, we don't know everything about 4k video or filmmaking – but we’re learning. With video especially, we’ve found that using the right tool for the job can make all the difference on set and in post-production. 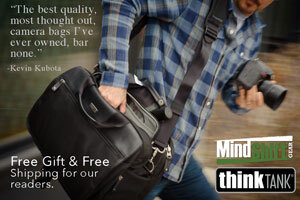 Our readers get FREE gear from ThinkTank and MindShift Gear when you use our link to buy anything over $50! Click here. Our Lunagrip is on sale now for only $99! ©2019 Kubota Image Tools, Kubota Market, AsukaBook, Kevin Kubota. All rights reserved. Duplication without permission is unlawful and just plain naughty.